I’ve lost count now of how many times I’ve been to Brussels. I’ve got the entire routine down, memorized, and I almost hate that because the trip is an enormous hassle. But always in the end, despite the extra-lengths of getting to and from Brussels via Spain is without a doubt worth ever second of the annoying journey. As always I sat on the plane, and then the bus, and then the train, nervously and anxiously and excitedly awaiting my arrival at Chez Peebles. My palms were sweating and despite being exhausted, I couldn’t sleep for a second on the plane due to my unnerving excitement. This trip was different than any other I’ve taken to Brussels. I usually go for just a weekend, a few quick days. This time I was going for eight whole days so I’d really get a chance to see more of Brussels and maybe even Belgium (getting to that). A part from going for a longer stint of time, I was also going to meet someone new, someone I met online (not like that), and I was overall thrilled to be getting out there. The last element that made this trip different was that I had just finished my first semester of my masters and I successfully passed all of my classes (there was a moment I thought I might not pass). So this was my break. Let’s back up to Saturday night, the night before I left. I wasn’t sleepy and my friends were going out so I wanted to do something despite knowing that my flight was at 6am the next day. I didn’t really care, so I went out with Patrik for a bit doing our usual routine here in Barcelona. We had just finished exams; we were both excited for the two-week break we’d been given and knowing that I was heading out the door to go to Brussels put all of us in an ecstatic mood. I eventually rolled home, not too late, fell asleep for a few hours, woke up and frantically packed. I was slow to getting a move so I had to pack quickly, hurriedly, and a bit concernedly that I might actually miss my flight. How did I let this happen? No idea. I went two blocks down from my place to catch the bus, but twenty minutes went by and it still hadn’t come to pick me up and take me to the airport. I ended up hailing a cab. I got to the airport and I was good on time. Of course then I had to jump through all of Ryanair’s ridiculous hoops, but I’m a R-air professional now so they got nothing on me. I found my place on the plane, turned on some Kendrick Lamar and sat restlessly during the two-hour flight. We finally made it to cold, snow-covered Belgium. It had been so long since I’d seen the snow. I always tell Europeans that I’m from Denver and when they don’t recognize the place name, I tell them I’m from the mountains and the snow. How I missed the snow! It looked like a postcard as we were just a few hundred feet up in the air, 10 minutes from landing. The world was covered in a fog-darkened sky and a white carpet of snow. We finally landed and I made my way to buy my 22-euro round-trip bus ticket to and from the airport. I got a coffee, sat down, read a few pages of my book, and then thirty minutes later I boarded the 1-hour long bus ride into actual Brussels (the plane takes you to Charleroi actually). Eventually we found our way to our destination city and I caught the relatively painless metro to Chloe’s house. After our big hello, we went out to a puddled market and ate some wrapped up honey-and-cheese ditties that were invented by I believe the Moroccan community in Brussels. Pretty delicious, especially with our beer-colored tea to keep us warm in the drizzle. Later, we wandered and visited a few other parts of the city and just caught up. We made our way closer to the center where we met up with Anna. 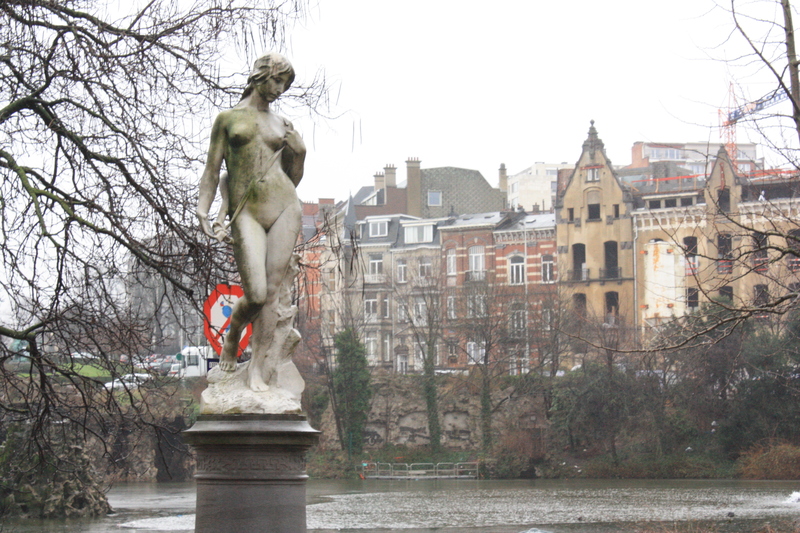 Here’s the short story about Anna – I found Anna on Tumblr months ago looking for blogs about Belgium and I found hers. I remember she kept posting about things that I care about– language, struggles/successes of living abroad, etc. So I ended up shooting her a message asking her what she’s doing exactly in Brussels to get more of an idea. 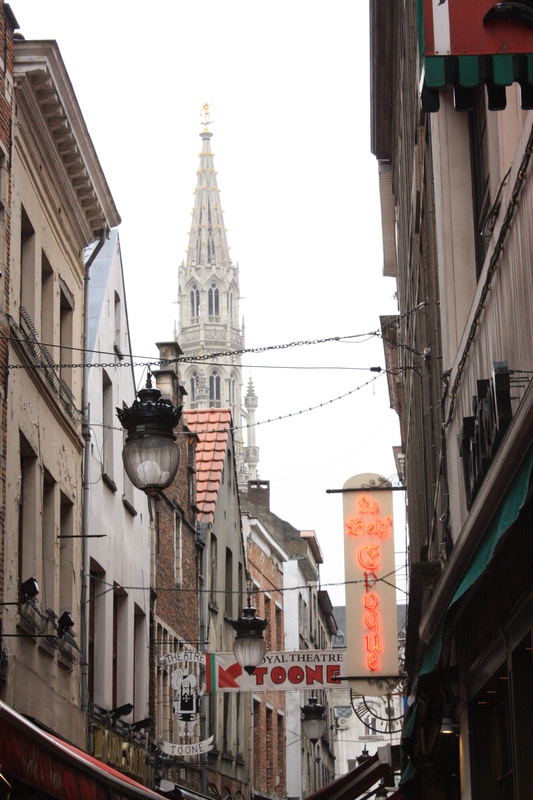 Plus, I forgot to mention she’s obsessed with Belgium and I could tell in her blog posts. I too am a big fan and I nearly did my masters there because I love it so much. So I had to ask what she was doing there. It turns out that she is a student in one of Chloé’s study abroad programs. I later found pictures of the two of them together (thank you, Facebook). It’s a small freakin’ world, people. Over a few months time, I got to talk to Anna more on the Internet and then since I was going to be in Brussels, we decided to meet up. The three of us jumped around between a few places and kept grabbing my favorite Belgian beers. Chloé wouldn’t let me order my actual favorite ones because she wanted me to try others: As it turns out, I love ALL OF THEM. My favorite Belgian beer is EVERY SINGLE ONE. There is something incredibly deep about these beers, and I’m relatively convinced that they put black magic into them. There are about five different flavors and tastes that one will experience while drinking them. I can’t fathom why no other beers have such potential. The first sip is usually sweet, then once you let go of the glass to finish your swallow, the flavor darkens into something heartier. After the gulp, you get the immediate after-taste of a whole new array of flavors. And for the finale, you’re left with a fruity after-taste that lasts until your next sip. I know it may be hard to believe, but I can taste a Belgian beer any day because of the instant fruit after-taste. I know they don’t put black magic fruits into their beers, but I swear you are left with fruit punch and not beer in your mouth. To fast forward through eight great days in Belgium, I’ll leave you with a broad summary: Chloé worked a lot during the week so I got to hang out with Anna and she showed me so much of the city. Bookstores, coffee shops, museums, great views, street art (incredible), and just all these hidden places in the city. I felt like I was being shown the city by a local (Anna’s from New York, upstate). When Chloé wasn’t working, there was always beer and food and laughter and fun. We’d go in and bring Chloé lunch on her long days, or we’d wait to go get dinner with her. A few nights we all went out with Chloé’s boss, Michelangelo, who has been working in Brussels for many years (he’s Dutch). He was a terrific guy who paid for the beers a few nights – really nice of him to do that. He loved hearing Chloé and I recount all of our tales from life in Madrid. Once you’ve got a few beers down the hatch, the real stories come out and Chloé and I were loving sharing the most ridiculous stories from our old lives in Madrid. Another night, I went to Chloé’s friend’s house who cooked us all Mexican food (which was great, thank you, Emilie!) and then we went to this big “party” somewhere far and cold from where we lived. We got to an old beer-making factory where they set up three dj’s on three different floors. We checked out the bottom basement level to find that the dj was only playing reggae. The sea of people were bouncing and jamming to the music. A cloud of smoke hovered over the dj. I was pretty stoked to have found reggae so I wouldn’t have to listen to techno/electronica all night like they played on the other two floors. I think I turned to Chloé and I might have said, “If they play The Specials tonight, I’m going to die.” And sure enough – The Specials came on. Any time The Specials come on, you know you are going to have a good night. Overall the night was pretty tranquila, but I still had a lot of fun. One day when everyone was too busy too pay any attention to me, I went to Ghent, which was an hour outside of Brussels. This was the first time I had seen any other part of the country. 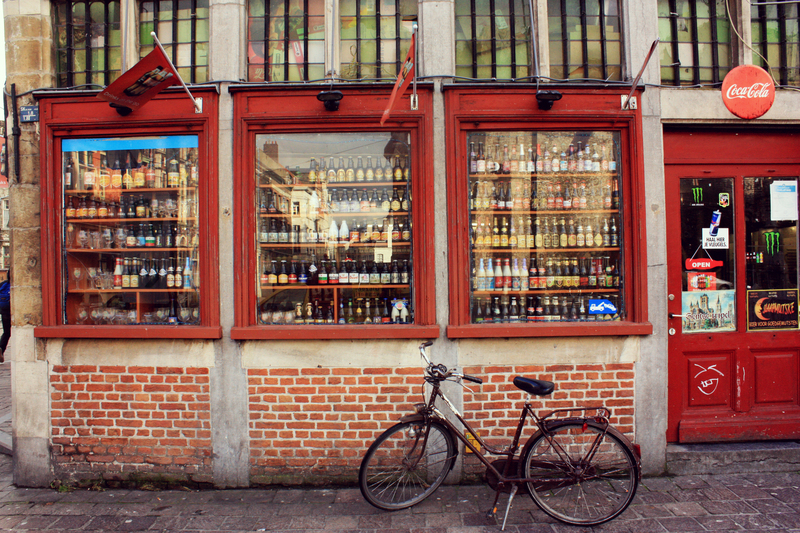 Ghent is a large university town – all the stores are full of hip clothes or snowboarding gear, all the bars had cheap student deals, and it seemed that the entire population was no older than 22. I didn’t have much of a plan so I wandered the city with my camera. It was breath-taking and stunning. It reminded me of Amsterdam with a Belgian coziness. I ate a sandwich with a Flemish spread called American (which is pretty funny by its name but it’s a well-enjoyed Belgian thing to eat). I wandered along the river that was incredibly inspiring. I kept pulling out my cellphone to write memos to myself about things to write in the future: I just felt so inspired and alive. I texted my mom because I wished she and my father could have been there to see the city. As much as I tell them about Spain, I think Belgium gets about the same amount of airtime. If they come, I’ll have to bring them back. My mother would die with all of the chocolates and my Dad’s favorite beer is Fat Tire (New Belgium Brewery) so I think it’s only due that he try some real Belgian deliciousness. I eventually meandered through the entire city and found a coffee shop called Simon Says (Anna’s recommendation). I sat there, enjoying my surprising café Americano (black): In Europe, they say that an American coffee is a splash of espresso drowned in hot water. Well that’s exactly what I was handed. On a small tray, I was given sugar (passed on that) and two hot steaming cups: One with espresso and the other with hot water to add. I laughed at the preposterous idea of serving a coffee like this in the United States, but I drank it and enjoyed it. After several hours, I needed to get back to Brussels. I grabbed my camera and my mind full of ideas, I went to my last destination before catching the train home. There is an entire alleyway dedicated to street art for taggers so that they don’t feel the need to graffiti all the old buildings. I noticed that the city was relatively graffiti-free unlike almost every other European city (I for one, love the graffiti, but that’s just me). I found this street covered in bright colors and the smell of fresh paint. None of the art particularly stood out to me but seeing a winding alleyway freshly blasted in hundreds of colors of spray paint was something very surreal. Finally, I caught the train back to Brussels. There was one other night in particular that still stands out in my head because I was so shocked at the situation. On this particular night, Chloé and I headed on our own ways (she had a dinner or something and I couldn’t attend) so Anna took me out with her Belgian friends. We met them in a bar so crowded you had to push your way through, and of course Anna’s friends were upstairs all the way in the back. A fantastic indie band was playing downstairs, and as much as I would have liked to have watched them play, we needed to find who we were meeting. When we were finally able to squeeze by (only after stepping on everyone along our way), climb the stairs, repeat the mad process to find our seats, we ordered beers and started conversation with her friends. I casually talked to her friends trying to get a feel for the place, them, and hoping that they all spoke English (which they did). I made the usual awkward small conversation with them and they were all nice but I wasn’t sure how well I was going to fit in. I zoned out from the conversation for a minute and just listened to the band that was playing at full steam. I wish I had caught their name because I really liked them. Out of the corner of my eye, I saw one of Anna’s friends pull out his cell phone and the background was the logo for While She Sleeps, one of my favorite metalcore bands. I stopped – “Hey, you like While She Sleeps?” – I practically yelled, floored to have seen that band’s logo appear on his phone. “YES!” he shouts to me and so does his girl friend. I started to talk to these two kids about all this metal music that we are all into. It’s not everyday that you meet people that like my kind of music, but especially not in Europe. Metal outside of the UK is pretty hard to find, and here I was with some of Anna’s best Belgian friends and they were all into my favorite bands as well. I guess that kid skates as well. Maybe it’s not that rare of a happening, but I was elated to have found people that listen to good music like I do. I needed that moment, a connection with someone about something that I’m so passionate about but it’s something that I have to suppress usually because I know no one likes my kind of music. So after that, the night went perfect, to say the least. The only downer to my trip was that my stomach was doing all kinds of uncool things to me that made a lot of eating and Belgian beer drinking a little difficult, but I’ll make you all think that I drank an ocean of Belgian beers (it’s better that way). On Sunday we went to a local Irish Pub to watch the Super Bowl, but it was pretty disappointing that my stomach was acting up so much because they were serving nachos and chili cheese dogs (so American!) which I would have CRUSHED any other day of the week but I opted out of it (major bummer). I guess the Ravens won the Super Bowl (I didn’t even know who was playing, don’t care either). Finally, Monday rolled around and I had to leave. Saying goodbye was especially difficult because I had made new friends and had had such a wonderful relaxing time discovering Belgium/Brussels. However, on the up side, my Masters is taking us all to Brussels in April to give us a tour of the European Commission so I’ll be back soon. I can’t wait. I love Belgium so much more than I already did. It’d be a place I could easily live in. Maybe I will someday. These short trips are terrific though because they aren’t long enough for me to get bored, but they are just enough to keep me hungry for more. I always feel so incredibly inspired, artistic, poetic when I’m there. Maybe it’s the rain. Maybe it’s the architecture and the streets. Maybe it’s the beer. Whatever it is, I want more, and I know I will be back to Belgian repeatedly for the rest of my life. As always, missing Chloé, and now Anna too, and until next time. Vive la Belgique. My bucket list is getting full thanks to you! 8-) Cuz now I need to go to Belgium! 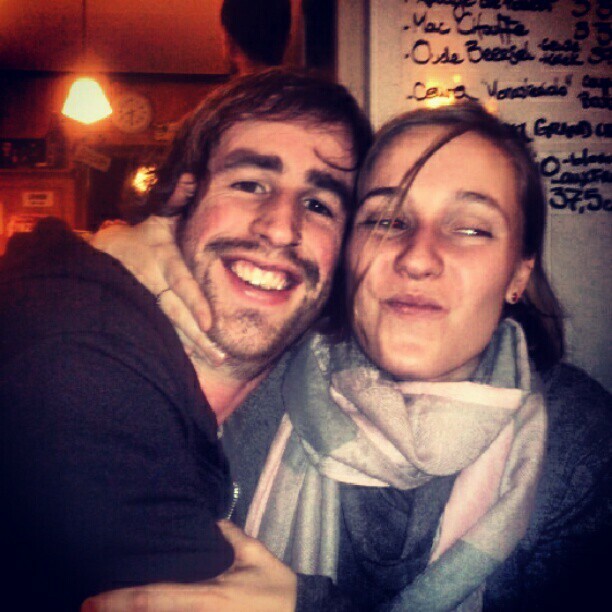 As much as I miss you, I’m so glad you get to have all these experiences with people and places……..and beer. 8-}. FYI – americain spread is raw meat… I probably should’ve warned you! Sorry! Graham, I love your blog. I discovered it about a month ago and have read the entire thing. I’ve applied to teach in Spain next year and am very excited for it! Reading your journey has been an inspiration to me and has kept me excited for teaching in Spain when there has been those few fleeting moments that I catch myself asking if I should really go and do it. Thank you!